I just got 3 letters in the mail Saturday from a collections agency(NCO financial).They are all the same amount of $34.25 but the Acct# are different in each letter.They say it is in reference to unpaid DHL shipping charges. I don't have a DHL account.Never have, I did however use them A LOT last year.100's of times more than likely.The only thing is you have to pay up front.There is no "tab" to put it on so to speak.I have no bill there and never have. I paid most of these with CC but several with cash.Of course I had a reciept for sometime but I haven't used DHL in a long time so the chances of keeping a $30 reciept are pretty slim.I've checked my CC online reciepts but they don't go back that far anymore.Thx Chase!! How in the **** do I owe these bastards anything?This type of service is paid prior to being done.I'm baffled. Not that the $34 bothers me but as it sits there are 3 of them and these places have ways of getting on your credit.They have never had access to my SSN. Tell them to show proof of shipping. Wrong he is doing it. Last edited by Milton Fox; 02-22-2009 at 05:34 PM. Last edited by Milton Fox; 02-22-2009 at 05:35 PM. I think the carp accidentally him. Looks like he is enjoying it though. If you can rule out and document that none of your packages incurred any extra charges your CC company would be billed for (Saturday delivery, packages exceeding estimated weight, etc.) DHL customer service should be able to help. I ship my stuff at the DHL place.The weigh it everytime and give me the bill.I pay the bill.It doesn't work any other way without an account.I do not and have not carried an account with them.hell they haven't done domestic ground for several mths now. You literally can NOT go into DHL and ship a package as a normal customer without paying 1st. That's what gets me.....and then 3 of the exact amounts at once...that's hilarious yet frustrating. NCO Financial is very real. All the shipments where paid CC or cash.Maybe the cash got up and walked away?...they have the CC# so what gives? I thought DHL was bankrupt or headed that way? 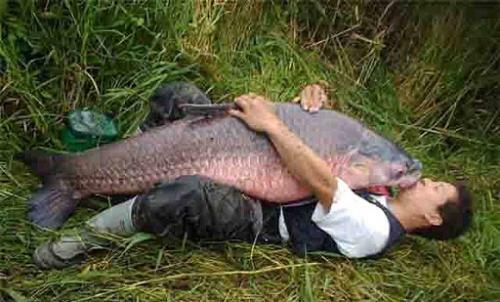 That kind of carp wouldn't **** me off because it would already be in the trash can. Do a Google of NCO Financial and see what sleazeballs these people really are. Mostly scamming trying to collect debts that really don't exist. They are very real and they are also crooked as hell and pull this kind of crap all the time. They've been fined and had all sorts of complaints filed against them.